Provide comfort for the family of Domingo Mendez with a meaningful gesture of sympathy. Domingo Peña Mendez, age 54, of Stockdale, TX, passed away Monday, December 3, 2018. He was born January 19, 1964 in Temple, TX to Enrique “Henry” and Selsa “Elsie” (Peña) Mendez, Jr., whom precede him in death. 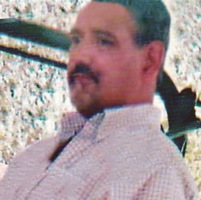 Domingo is also preceded in death by his maternal grandparents, Pedro and Anita Peña; paternal grandparents, Enrique and Refugeria Mendez Sr.; siblings, Roland, Robert, Daniel, Joe Henry, Henry III, Angel, Richard, Dora and Maria Elena; nephews, Pedro Rangel Jr. and Brandyn McKay Elkins; niece, Ezra Elena Perez. He is survived by his siblings, Jesse P. Mendez, Sulema Rangel, Salvador Mendez, Tony Mendez, Johnny Mendez, Mary Shaw, Sally Mendez, Linda Mendez Sanchez, and Anita Mendez; numerous nieces, nephews and other loving family. A visitation will take place Wednesday, December 5, 2018 from 5pm to 8pm at Finch Funeral Chapel, Stockdale, with a Rosary Vigil recited at 7pm. A funeral procession will depart the funeral chapel Thursday morning, December 6, 2018, at 9:30am. To send flowers in memory of Domingo Pena Mendez, please visit our Heartfelt Sympathies Store. Provide comfort for the family of Domingo Pena Mendez by sending flowers. I am sorry for your loss. My deepest sympathies go out to your family at this difficult time. Domingo was loved and will be missed.